Several groups of Colts and Fillies members have visited Miss Inga Sock at home to learn all about how she is trained and to see how a racing yard operates. We had a great day out in Newmarket. The morning began at the National Horseracing Museum where we learnt all about the history of horseracing and saw some amazing exhibits. We then had great fun in the practical gallery where we experienced the thrill of riding a winner on the horse simulator and took part in some hands on activities. After lunch we moved to Banstand Manor Stud, the headquarters of Juddmonte's European breeding operation, to hear a little about their operation and meet some of the stallions. 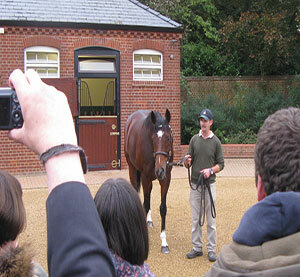 We were all more than a little starstruck to meet equine superstar Frankel, definitely the highlight of our visit. 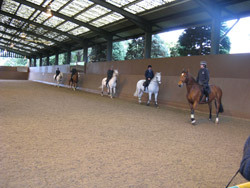 A group of Colts and Fillies members visited Imber Court, the training establishment of the Metropolitan Police's Mounted Branch. From its humble beginnings in 1760 the Mounted Branch of the Metropolitan Police has adapted well to the changing needs of the society it serves, and it continues to play a key role in modern day policing. With a strength of over 140 officers and 120 horses based at eight operational stables spread across London their job sees them carrying out a variety of roles including high visibility patrols, public order duties as well as specific crime initiatives and specialist events such as Trooping the Colour. On arrival at Imber Court we were met by Natasha who has been looking after the police horses for over 20 years. We enjoyed a tour of the establishment, watched some of the officers in training, explored the museum and got to meet and say hello to some of the horses. We had a great day and learnt all about the mounted police and its varied work. There was just time for a light lunch and a chance to talk about what we had seen before we all had to head home. The team at Imber court ensured we had relaxed and informative trip and we all enjoyed a great day. Just a quick note to thank you so very much for the fantastic time Molly and I had, it was fantastic and extremely interesting - so thank you very much indeed! In July seventeen Colts and Fillies members went to visit Dalham Hall Stud in Newmarket. The stud is part of Darley, one of the world's largest breeding and racing companies, who breed racehorses for Sheikh Mohammed, the ruler of Dubai. Dalham Hall Stud was Darley's first stud farm, bought in 1981. The stud is now made up of 12 separate farms, including Dalham Hall, and covers around 3,750 acres of land around Newmarket - equivalent to over 1,500 football pitches! On arrival at the stud farm we were given an introduction to Darley and Dalham Hall before going to meet some of the stallions in their paddocks. We then enjoyed a behind the scenes tour and an informative talk about how the stud works before visiting some of the foals who may be the stars of the future. The visit finished with lunch and a chance to watch a DVD of some of Sheikh Mohammed's great horses in action. The Colts and Fillies members were all given a Darley kids pack which contained a wealth of information, fun things to do and a chance to try and name some of the horses which will be going into training. The Dalham Hall team ensured we had a warm welcome and a really enjoyable day was had by us all. I just wanted to say thank you so much for the wonderful visit that my daughter Bella and I went on to Dalham Hall Stud Farm this week. We had the most marvelous time - truly a day we will never forget!! We had the most exceptional treatment from everyone and Bella came away vowing that her future career (and life!) would be spent there. 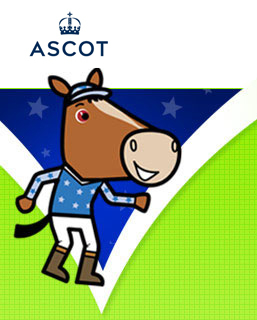 It was a great way to get children (and adults) excited and involved with racing so well done to Ascot Colts & Fillies! 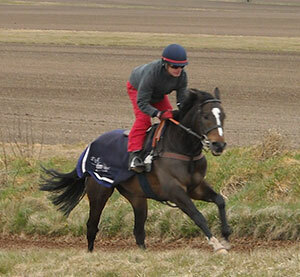 We have been on three trips this year to Eve Johnson Houghton's yard to see Catchanova, our horse in training. The Colts and Fillies members enjoy a tour of the yard, learn about how a racehorse is trained, watch the horses on the gallops and of course, say hello to Catchanova. We have also been on several visits to the races to cheer Catchanova on. 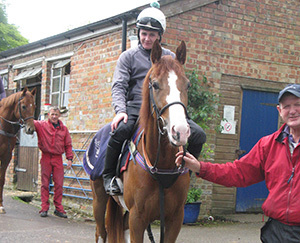 Yurituni was busy racing during 2012 and Colts and Fillies members were able to enjoy trips to Kempton, Haydock, Bath, Brighton, Nottingham and Goodwood to cheer her on. Although we didn't win we did have a very exciting 2nd at Brighton and a tremendous amount of fun. Three groups of Colts and Fillies members visited Woodway during the year to enjoy a tour of the yard, see the horses work and of course say hello to Yurituni. Eve and her team always make us very welcome and give us a great insight into what is involved in training a racehorse. 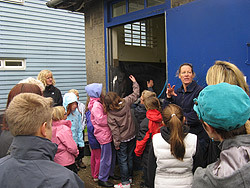 During 2011 we took three groups of Colts and Fillies members to Robins Farm Stables to visit our horse, Safari Team. On arrival everyone gathered in the Owners Room to meet Peter and Anton and enjoy refreshments before being taken on a tour of the yard and training facilities. Anton and Peter were wonderful hosts explaining all about how the yard worked and the horses were trained. The highlight of the trip was always meeting Safari Team and all our members got to personally say hello to him, he was always wonderfully behaved and accepted all the welcoming pats that came his way. During our first visit Frances Flannagan, who won the competition to design the Colts and Fillies Club silks, was presented with a framed miniature set of silks by Peter and the members were able to see our silks all made up ready for Safari Team�s first run. We will be running further trips to the yard during the season, if you would be interested in taking part please see the how to get involved section. If you would like copies of any of these photographs please e-mail coltsandfillies.co.uk with your request.